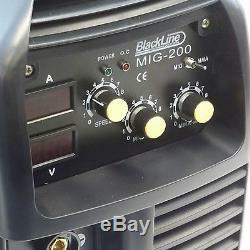 Blackline 200 Amp MIG MAG MMA (ARC) Welder - MIG200. MIG200 is an excellent choice for professional workshop use but still light enough (19kg) to be portable. The inverter IGBT technology offers a much higher duty cycle and lower weight than conventional welding machines. As an example to match the current output of MIG200 a conventional welder may weight 35kg with only 35% duty cycle, the cost difference is now minimal. European plug-in hose connector and LCD displays. DC current, fan cooled, thermostatically protected, suitable for gas MIG/MAG or flux (gasless) welding wire. Also suitable for welding low carbon, low alloy, stainless steels, aluminium and aluminium alloys. Rated Input Capacity: 8.2kva. Wire Diameter: 0.6 - 0.8mm (reversible wire feed wheel). NOTE: This welder requires a 30 Amp connection and is not suitable for domestic 13 Amp sockets, a 32 Amp male/female connector will be supplied but you will require the services of a qualified electrician to install this before use. 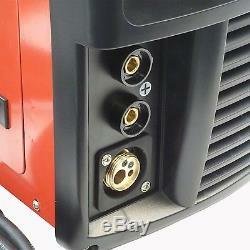 The welder does not come with gas, regulator, gas hose or welding wire. You will need to supply these before you can weld, we do not sell these items. Rally Design are official European distributors for the Blackline professional tool range. Professional quality tools at a mid-range price level. UK Based business, established 40+ years. Massive stocks held in our UK warehouse, not held in China! Every product comes with vatable invoice, VAT No: GB 765388288. We are engineers who know our jobs and only offer quality products. 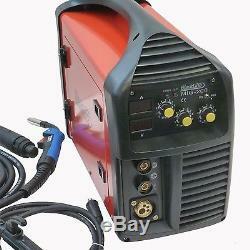 The item "200 Amp MIG Welder MAG MMA (ARC) MIG200 Blackline Tools" is in sale since Wednesday, October 25, 2017. This item is in the category "Vehicle Parts & Accessories\Garage Equipment & Tools\Workshop Equipment & Supplies\Welding Equipment". The seller is "rally-design" and is located in Whitstable.